The Pitney Bowes SendPro P1500 franking machine is one of the latest high volume franking machines from Pitney Bowes. It is part of the SendPro P series of franking machines supplied by Pitney Bowes. This machine is slightly larger in size than other machines and has a franking speed of 120 or 60 letters per minute, depending on the settings chosen. The SendPro P1500 comes with advanced features and functionality that makes it simply incredible to use when needing to send large volumes of mail. One of the main benefits of using the Pitney Bowes SendPro P1500 franking machine is that it comes with the latest Smart Meter and Mailmark franking technologies. This means that the Pitney Bowes SendPro P1500 franking machine is up to date and able to give users all of the extra benefits that non-Mailmark franking machines do not possess. Another impressive feature that the Pitney Bowes SendPro P1500 franking machine possesses is a weighing scale. A 7 Kg scale (which can be upgraded to a larger scale) is integrated into the machine as standard and this will allow users to accurately weigh and price all of their mail up, eliminating any risk of miss paying with the Pitney Bowes SendPro P1500. 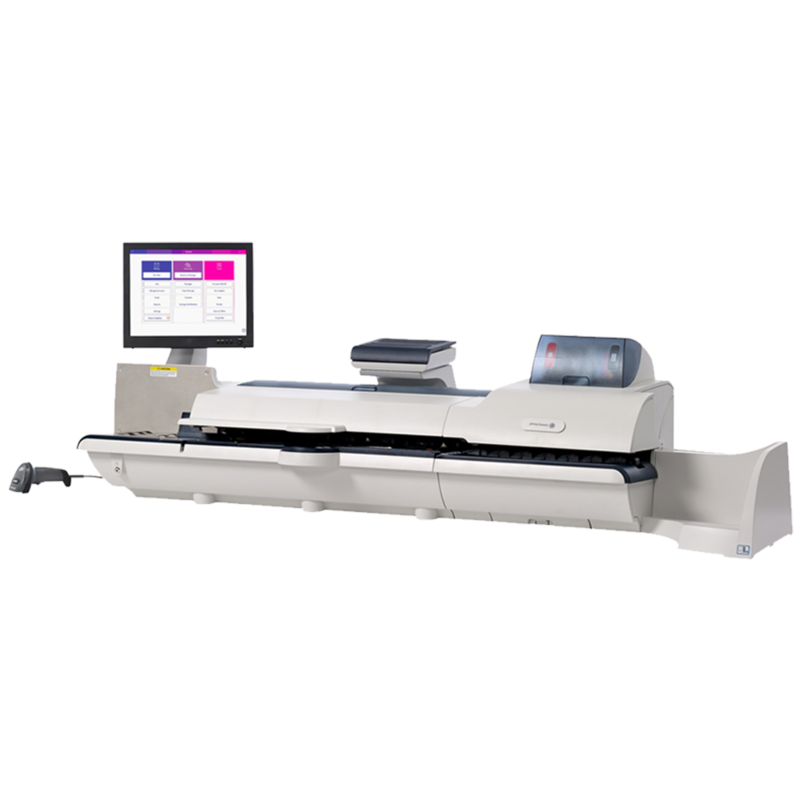 A long with this feature, similar to most of the other SendPro machines, this model comes with Weigh-on-the-Way® (WOW®) and Dimensions-on-the-Way® (DOW®) weighing capabilities. Other features that can be accessed with the Pitney Bowes SendPro P1500 Mailmark franking machine includes PIN security, a barcode scanner, departmental accounts, franking a company logo or advert, job memories and connecting to LAN or Wi-Fi. View our range of Pitney Bowes SendPro P1500 franking ink here. View the Pitney Bowes SendPro P1500 franking machine specifications and find out key details about the Pitney Bowes SendPro P1500 franking machine below and find out what features it possesses. If you would like to purchase some low cost meter envelopes for the Pitney Bowes SendPro P1500, view our range of meter envelopes here.